I have just become aware of an innovation in natural building that could become extremely popular in time. 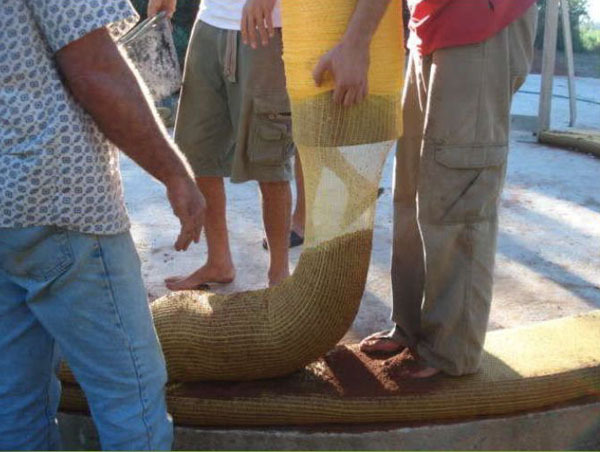 Hyperadobe is similar to conventional earthbag construction, except that is uses mesh tubing instead of the solid polypropylene fabric. This innovation comes to us from Fernando Pacheco, a Brazilian engineer, and it has been used in Brazil for at least two years. The use of the mesh makes the resulting wall a kind of hybrid of rammed earth, cob, adobe and earthbag building, all rolled into one. It has the advantages of all of these earthen building techniques, without many of the drawbacks. This is because the mesh allows the damp adobe soil (sand and clay) to bond with itself right through the open weave of the netting, so that the wall becomes virtually monolithic. Rammed earth also creates a monolithic wall, but it requires the use of very strong, rigid forms on both sides into which the soil is placed and compacted; Hyperadobe uses the tube netting as the form which is then incorporated into the wall itself and helps stabilize and reinforce it. Cob needs to be thoroughly mixed with straw to help make it cohere as a solid, monolithic material, which is then placed on the wall in small increments (cobs) so as not to deform while it cures. Hyperadobe eliminates the need for the straw because the tubular netting holds it all together. 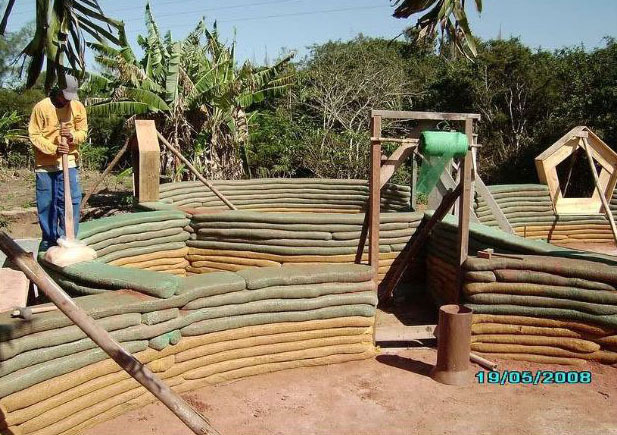 This means that the wall can be built and solidly tamped immediately without the need to wait for the material to cure, and eliminates the time and labor consuming step of mixing the straw with the adobe soil. Adobe blocks have to be individually manufactured in forms and dried in advance of being placed and mortared onto a wall. All of this is very labor and time intensive, and is completely eliminated with the Hyperadobe method. Conventional earthbag building, while very similar to this method, differs in several important ways. Because the polypropylene bag material (either in tubes or individual bags) is relatively slippery, it must be combined with barbed wire (usually two strands per course) between each course. Because of the friction that naturally occurs between the adjacent net material when compacted together, the need for barbed wire is eliminated, especially in vertical wall structures where the superior tensile strength of the steel is not needed. Also with poly earthbags, it takes much longer for the fill material to dry out or cure, since it doesn't breathe nearly as readily. This means that the Hyperadobe walls can be plastered sooner and may not need the application of separate plaster mesh because the mesh is already covering the wall. Many plasters, especially earthen plasters will adhere much more readily to the exposed soil within the netting, making the wall even more monolithic. 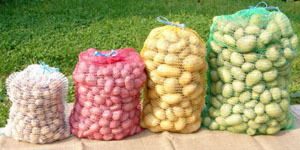 Hyperadobe uses a knit raschel, the same material used in packaging produce, which leads to less cost compared to the poly bags. Raschel is a knitted fabric which resembles hand crocheted fabrics, lace fabrics, and netting. The most common material used to knit raschel tubing is high density polyethylene (HDPE). Both HDPE and polypropylene materials have poor resistance to the UV from sunlight, and must be protected as much as possible against such exposure. However the HDPE netting would have some natural protection because it become partially embedded in the fill material when tamped. The more opaque the plastic is, the more resistant it will be to UV, so if there is a color choice, black is the best. To further understand this exciting new building technology, I suggest checking out the Step-by-Step instructions provided by the inventor himself. This is from one of my other websites that focuses entirely on earthbag building.